Piedmont, Italy’s north-western region, is famous for outstanding cuisine and rivers of world-class red wines such as Barolo, Barbera and Barbaresco. Go truffle hunting in Italy for the prized white truffle and learn from the master chefs how to cook an authentic Piemontese feast. Combined with the vineyard-laced hills of the UNESCO site Langhe, this is truly is a gourmet’s paradise and perfect for insiders. If you prefer to travel at your own pace with our local guides, our private trips are for you. Our culinary journeys focus on immersion into the local culture. We introduce you to experts who invite you into their culture and kitchens to participate. Min 2 guests. Piedmont (Piemonte) in Northern Italy is a noble and stunning region with Turin as the jewel in its crown. The streets and squares of this former capital of Savoy, a city of writers and industrialists, exude a theatre-like quality and natural elegance. Piedmont also boasts the Langhe and Montferrat, which were both recently declared UNESCO World Heritage Sites. Mid-way between the Alps and the sea, the hills of the Langhe form the most internationally well-known area of Piedmont thanks to its culture of gourmet wine and food. Spectacularly beautiful old towns, orderly vineyards and hills crowned with ancient castles which look straight out of a film set are home to excellent wineries where visitors can sample Barolo, the “king of wines”, and its entourage: Barbaresco, Nebbiolo, Dolcetto, Barbera and Moscato. And of course there is Alba, located in the hills of the Langhe and epicenter of trade in Italy’s top culinary commodity — the white truffle. In this special cooking class at a castle near Alba in the Piedmont, you will learn how to create delicious Piemontese favourites whilst being inspired by a local chef trained in the Langhe with a genuine passion for Piemontese foods. The class is located in a restored castle in a small Piemontese village and led by a Master chef who uses selected natural ingredients and innovative ideas to create dishes with passion and taste. The class includes the preparation of a four-course menu then a sit-down meal accompanied by wonderful local wines. Truffles – Chocolate – Cheese – Coffee – Wines! The region’s most highly-prized product is the white Alba truffle, the “Tuber magnatum”, a real underground treasure which triumphs in autumn in the finest local restaurants served alongside a variety of PDO (Protected Designation of Origin) cheeses and Piedmont hazelnuts, “Tonda Gentile delle Langhe”, which form the basis of Gianduja chocolate. Between the locals and chocolate there is a 350 year old love affair and it’s no surprise that Piemonte and Turin have both played a leading role in the Italian chocolate industry. The world-famous Slow Food Movement started in Piedmont and the restaurants in Alba proudly advertise their allegiance to the movement. Since its beginnings, Slow Food has grown into a global movement involving millions of people, in over 150 countries, working to ensure everyone has access to good, clean and fair food. The wines of Piedmont are of exceptional quality and usually made with grapes unique to the region on tiny family plots, making the countryside a lovely patchwork of vineyards and small farms. Barolo is called the king of reds and is considered one of Italy’s top three wines, the richest and heartiest of the Piedmont wines, and the one most likely to accompany game or meat. Barbaresco, like Barolo, is made exclusively from the Nebbiolo grape though it is less tannic. Barbera d’Alba is smooth and rich, the product of the delightful villages south of Alba. Dolcetto is dry, fruity, mellow, and dry, not sweet, as its name leads many to assume. Nebbiolo d’Alba is rich, full, and dry. The white Spumanti DOCGs are the sparkling wines that put Asti on the map, and Moscato d’Asti is a floral dessert wine, while the fiery local Piedmmont grappas are none too shabby either. Stay in an elegant hotel, located in the heart of the Langhe region, just a few minutes away from the truffle capital Alba. A superb renovation of an 18th century estate, placed on a hill crest between lush woods and hazelnut trees, with breathtaking views over the Alps and the delicate Barolo vineyards. The perfect base to discover this magical territory, rich in flavours and tradition. The elegant and warm interior and the gardens of the villa are designed with the charming atmosphere of a private home, with great personal care for each guest. 3 or 6 nights. 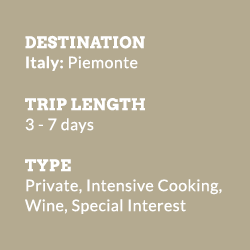 Our suggested 3 nights/ 4 days itinerary is a food experience in its own right or can be added on to an extended itinerary. Both itineraries can be entirely tailor-made according to your preferences. 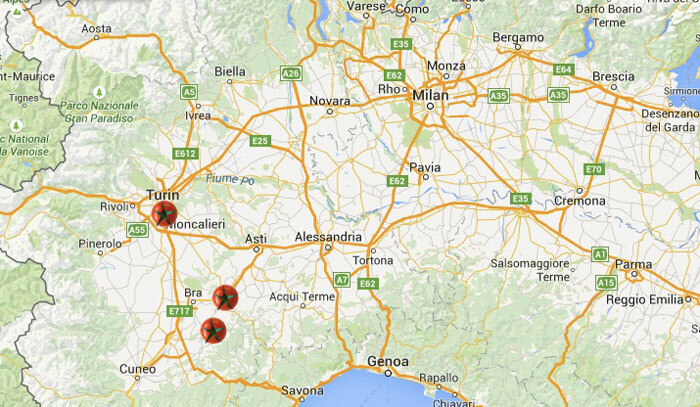 Nearest airport is Turin, Genoa or Milan. Rent a car, alternatively we will arrange all local transfers. My husband and I have just returned from the most fabulous experience in Italy. The cooking class at the castle was really special and the truffle hunt was extraordinary. A memory we will cherish forever and we are still talking about. I can’t wait to get my hands onto some truffles and cook some of the delicious dishes we learned to impress our friends and family! It was a delicious and fascinating experience and I would recommend it highly to anybody who is serious about their food and wine! 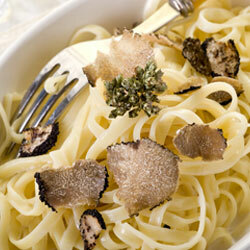 “The truffle hunt was an amazing experience for our entire family. It was fun to roam the forest with Giorgio and his dog. And of course to finally find and taste the precious truffle. The wines to go with it were excellent and we also very much enjoyed our cooking course with Angelo.